This article contains interesting facts, trivia and information about the Presidents on Money. The Coinage Act established the United States Mint and regulated the coinage of the United States. The Coinage Act was passed by the US Congress on April 2, 1792 and the earliest US money was in the form of coins. The first one dollar bill was issued as a Legal Tender Note in 1863. The Coinage Act required coins to have "...an impression emblematic of liberty." What better symbols of liberty are the US Presidents which is why there are so many examples of Presidents on Money. What are the names of the US Presidents on money? The coins of the US feature the portraits of Abraham Lincoln, Thomas Jefferson, FDR, George Washington, JFK, and Dwight Eisenhower. The bills of the US feature the portraits of Presidents Washington, Jefferson, Lincoln, Jackson, Grant, McKinley, Cleveland, Madison, and Wilson. Abraham Lincoln Penny - Abraham Lincoln: The obverse (front) of the penny (1 cent coin) has featured the profile of President Abraham Lincoln since 1909. Thomas Jefferson Nickel - Thomas Jefferson: The obverse (front) of the nickel (5 cent coin) has featured the profile of President Jefferson since 1938. Franklin D. Roosevelt Dime - Franklin D. Roosevelt: The obverse (front) of the dime (10 cent coin) has featured the profile of President FDR since 1946. George Washington Quarter - George Washington: The obverse (front) of the quarter (25 cent coin) has featured the profile of President Washington since 1934. John F. Kennedy Half Dollar - John F. Kennedy: The obverse (front) of the half dollar (50 cent coin) has featured the profile of JFK since 1964. His portrait was designed by Gilroy Roberts. Dwight Eisenhower One Dollar - Dwight D. Eisenhower: The obverse (front) of the dollar coin featured the profile of President Eisenhower from 1971 to 1978. George Washington $1 - George Washington: The portrait of George Washington, painted by Gilbert Stuart, has been displayed in the center of the obverse (front) of the one dollar bill since the 1869. Abraham Lincoln $5 - Abraham Lincoln: The portrait of Abraham Lincoln was taken from a photograph by Mathew Brady. The $5 note featuring Abraham Lincoln was first issued in 1914. Andrew Jackson $20 - Andrew Jackson: The $20 note featuring Andrew Jackson was first issued in 1928. Ulysses Grant $50 - Ulysses S. Grant: The $50 note featuring President Grant was first issued in 1861. The following Facts file contains interesting trivia about the Presidents of the United States of America who appear on US currency. Presidents on Money Fact 1: The Presidential $1 Coin Program is part of an Act of Congress (The Presidential $1 Coin Act of 2005) is an Act of Congress that directs that directs the US Mint to produce $1 coins with engravings of relief portraits of U.S. presidents on the obverse (front). Presidents on Money Fact 2: The United States $1 Coin Act specifies that for a president to be honored, the former president must have been deceased for at least two years before issue. Presidents on Money Fact 3: Commemorative coin programs are created by acts of Congress to honor a special person, place or event. Presidents on Money Fact 4: The inclusion of the United States motto, "In God We Trust," on all US currency was required by law in 1955. The motto first appeared on paper money in 1957. Presidents on Money Fact 5: The Presidents on money were all two-term presidents who were popular with Americans in their day. Presidents on Money Fact 6: The 10 dollar bill and the 100 dollar bill do not feature pictures of presidents. The $10 bill shows Alexander Hamilton who was never president. The US $100 bill features Benjamin Franklin, who has never been president. Presidents on Money Fact 7: President Abraham Lincoln signed the National Banking Act On February 25, 1863 when the federal dollar was established as the sole currency of the United States of America. 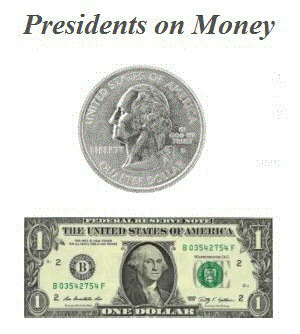 The Presidents on Money list provides a fast overview of the key facts and trivia about the Presidents on Money. The following President of the USA video enables you to sit back and listen to the history of the personal and political lives of all the President of the USA - a useful educational resource for kids, children and schools learning about the Presidents of the United States of America. Facts and info about Presidents on Money.